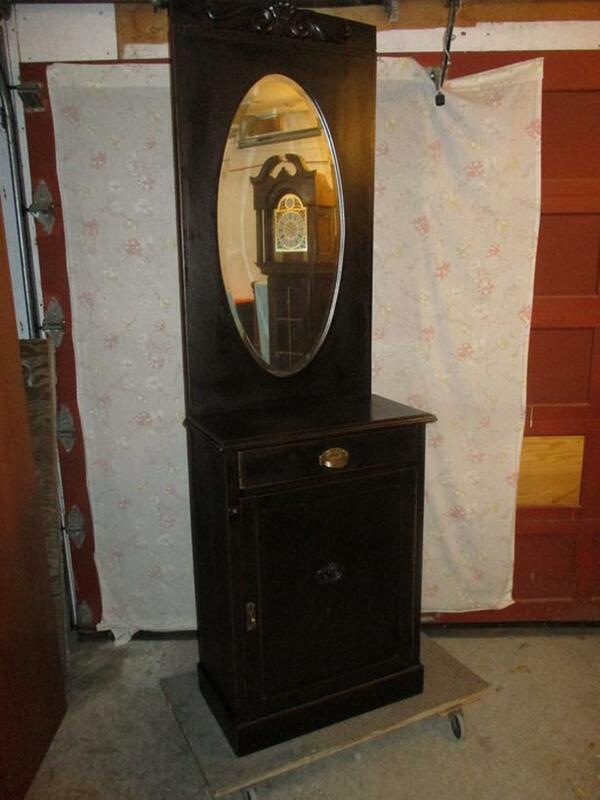 THIS OAK DRESSING CABINET IS 25 INCHES WIDE, 14 INCHES DEEP AND 78 INCHES HIGH. THE OAK BACKBOARD GOES FROM THE TOP TO THE FLOOR. AT THE TOP OF THE BACKBOARD IS A CARVED DESIGN. BENEATH THIS DESIGN IS AN OVAL 1 INCH BEVELLED MIRROR. THE MIRROR IS 15 INCHES WIDE AND 32 1/2 INCHES HIGH. BELOW THE MIRROR IS THE COUNTER TOP. IT IS 35 INCHES FROM THE FLOOR. UNDER THE COUNTER TOP IS A FULL WIDTH PRE 1900 DOVETAILED DRAWER. ( SEE PICTURE OF DOVETAILING }. BELOW THIS DRAWER IS A FULL DOOR COVERING TWO SPACIOUS SHELVES. THE TOP SHELF IS REMOVABLE. ON THE FRONT OF THE DOOR IS A CARVED FLOWER IN A VASE. THE WHOLE OAK DRESSING CABINET SITS FLAT TO THE FLOOR. THIS DRESSING CABINET IS CLEAN, ODOUR FREE AND READY TO USE.